Titan Z product line brought to you by Shawcor. Combining the resources, expertise and technologies of DSG-Canusa and ShawFlex, we're able to offer a complete range of custom cable and advanced cable accessories to simplify installation and to protect your electrical systems. We have received positive reviews from several electric utilities evaluating the unique design and application features of TITAN Z. Power cables are extensively used in the underground distribution of electricity and typically tap off power at overhead lines using a variety of termination products. One of the most common ways is the use of cold applied technology that does not rely on any additional tools during application. DSG-Canusa branded cable terminations from Shawcor, named TITAN Z offers an evolutionary design that brings benefits of fewer installation steps, superior technical performance as well as the lowest installed cost product on the market. 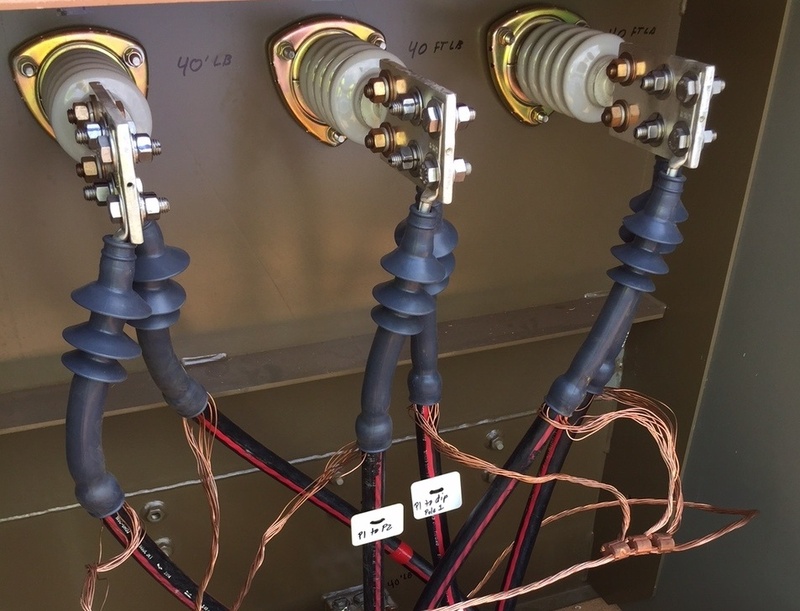 Since the launch of TITAN Z medium voltage cold shrink cable terminations in April 2015, several North American utilities have given impressive technical reviews on their evaluation of the all-in-one, easy to use design. New product features announced in 2017 include a TITAN Z product line that has been extended to cover the full 5-35kV voltage class for both indoor and outdoor applications. The new 35kV product line extension offers application on 1/0awg to 1500kcmil conductor sizes with just two size ranges. i.e. 1/0awg to 350kcmil and 350kcmil to 1500kcmil. Lesser number of housings to cover the standard cable range means the end user benefits from carrying reduced inventory and increased job site flexibility. 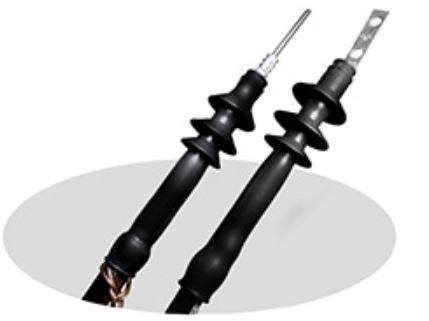 The indoor terminations are based on tubular designs that offer an option to install terminations in indoor environments without the use of rain skirts. Coupled with fast turnaround of complete products from Shawcor’s Ohio Distribution Centre, Titan Z offers one of the most versatile and easiest to install products in the marketplace. It is widely accepted that poor cable preparation is the leading cause of cable termination failures. Lab testing using Titan Z’s proprietary zinc-oxide (ZnO) based stress control mastic (ZinkSil) and its void filling properties, clearly demonstrates a reduction in failures that could otherwise be caused by cable prep flaws. ZinkSil’s non-linear, resistive field grading design uses ZnO microvaristor technology that can be tuned to a certain switching voltage. It’s made by mixing ZnO particles with an inert carrier to make a flowable material that has outstanding stress grading electrical properties. Titan Z was benchmarked against a leading competitive product being applied on a cable simulating an improper semicon cutback. Based on the electrical test results, Titan Z outperformed the competitor product in terms of its ability to fill voids and pass the partial discharge test without breakdown. For utility and systems operators, this is a welcome benefit; less failures means more up time and productivity, greater service levels and lower maintenance and repair costs. 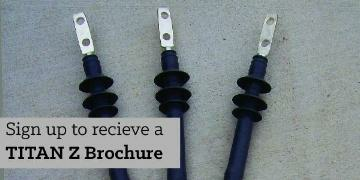 The Titan Z medium voltage cable termination can be installed very easily. The system features an enhanced spiral ripcord design using smooth edges that make unwinding during installation much easier on all types of cable. The ripcord pulls in seconds, securing the rubber body onto the prepped cable to form a solid, stable installation no matter what the operating environment. The spiral core assembly is also heat tacked to prevent unraveling during shipping and handling thus making it more robust. With all of the above advantages, TITAN Z cold shrink cable terminations are sure to provide electrical engineers, operators and consultants with peace of mind knowing that they can count on a new level of performance, safety and reliability from a long standing, trusted supplier. 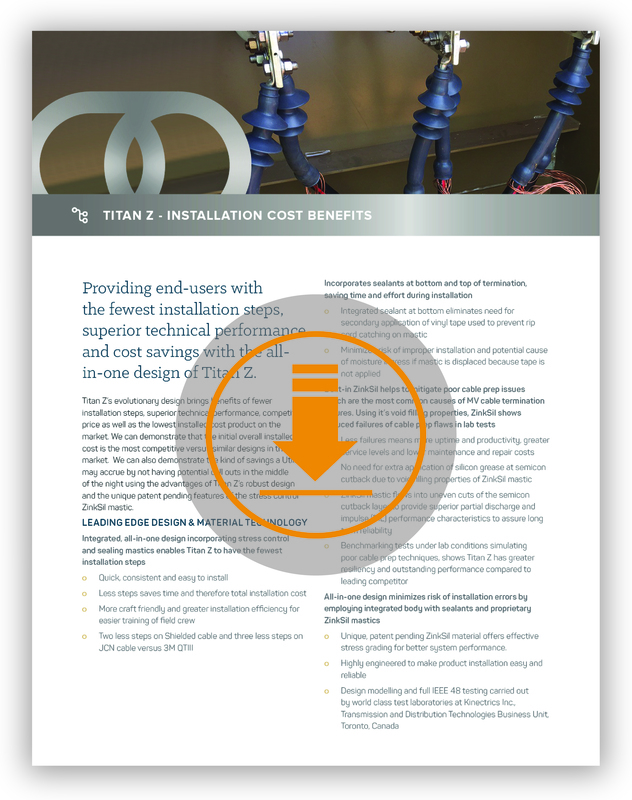 Developed by Shawcor's Connection Systems Group, Titan Z's integrated all-in-one design incorporates stress control and sealing mastics which enables Titan Z to have the fewest installation steps. See how we compete in the industry. For more information on our Titan Z products, please visit the Titan Z Product page.